Many i-café owners predicted intensified anti-piracy campaign if the Microsoft I-Café Program would fail on its target compliance by the industry. The program which offered the low prices of PhP2,299.00 for Windows 7 and PhP999.00 for MS Office 2007 to i-café owners currently using the pirated versions of Microsoft operating system and productivity suite ended last May 26, 2010. There is no official report on how the MS I-Café Program fared but whether by design or coincidence, the Pilipinas Anti-Piracy Team (PAPT) is now all over the place giving warnings and conducting raids on businesses using Microsoft software products. 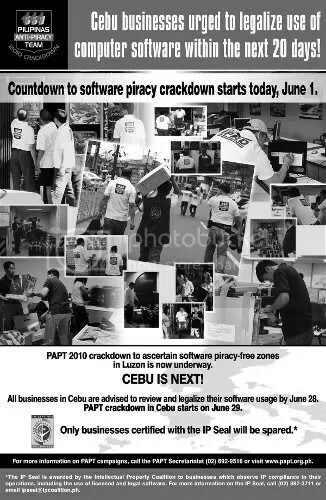 A news report at PAPT website says that since it declared its 2010 campaign against software piracy in March, the team has already conducted 15 corporate end-user raids, 3 retails raids and 9 corporate routine inspections in numerous cities within Metro Manila. It also reported that almost eighty (80) i-cafes in Metro Manila and Bicol have also been subjected to PAPT routine inspections. In its most recent move, the PAPT composed of the National Bureau of Investigation (NBI), the Optical Media Board (OMB) and the Philippine National Police (PNP) declared the official start of the 20-day grace period given to businesses in Cebu to legalize their use of software. The 20-day grace period given by the PAPT in Cebu starts Tuesday, June 1, 2010 and will end on Monday, June 28, 2010. PAPT enforcement actions will resume on Tuesday, June 29, 2010. An added instruction in the campaign is business establishments with the IP Seal will be spared from PAPT enforcement actions. The IP Seal is awarded by the Intellectual Property Coalition (IPC) to businesses that observe compliance with the intellectual property (IP) laws in their operations, including the use of licensed and legal software. The PAPT maintains a memorandum of understanding with the IPC which covers this provision. Let me stop my blog post here as I do more research on the issue. I am not a lawyer so I have to seek the legal opinion of a lawyer-friend regarding the legality of having the IP Seal as the basis of doing the inspections (raids) by the PAPT. At the moment, I cannot agree that a private organization like IPC will have the right to determine who is complying and who is violating the Intellectual Property Code of the Philippines. Wait for my next post on the issue. In the meantime, you may post your comments about this move of PAPT.